The launch of Battle for Azeroth certainly drew out some new quirks and issues that weren’t apparent during the beta, however we have been quick to squash some particularly nasty issues such as the recent Auction House hotfix from Blizzard. Let’s take a look through some of the highlights of the recent updates, and if you haven’t tried TSM4 since the initial release then now might be great time to dive in again! We heard you loud and clear regarding the Shopping interface, it wasn’t where it should have been and in some aspects was a step back from TSM3. A different design direction didn’t quite work out and we’ve given the Shopping interface a makeover. Reintroducing the ‘Post’ button, you can now throw the inconvenient hammer icon out and post an item even if there are none listed at the time. 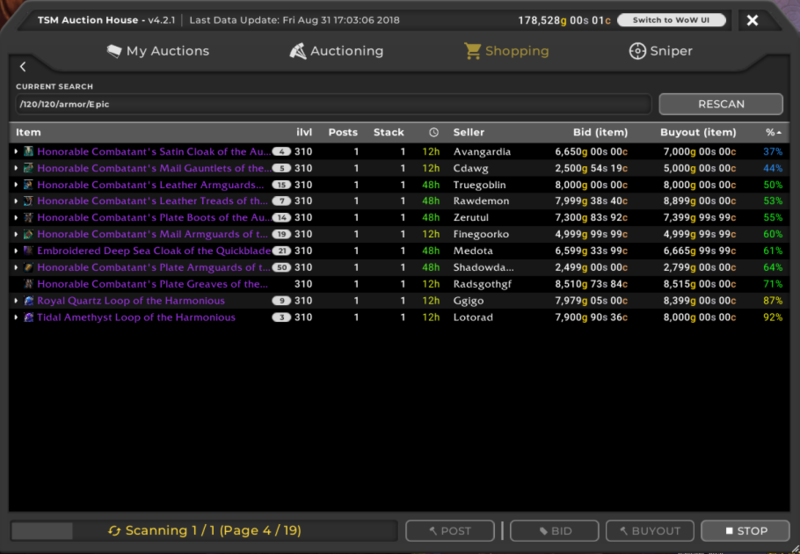 In addition, you can now see how many auctions are posted for a particular item and your own auctions or auctions you’ve placed a bid on are highlighted for quick reference. The ‘Stack Size’ and ‘Quantity’ data for auctions have now also been split into two columns for neater information, and there is now also an option to enable a confirmation button to all buyouts if you’d prefer to not to immediately purchase when clicking. 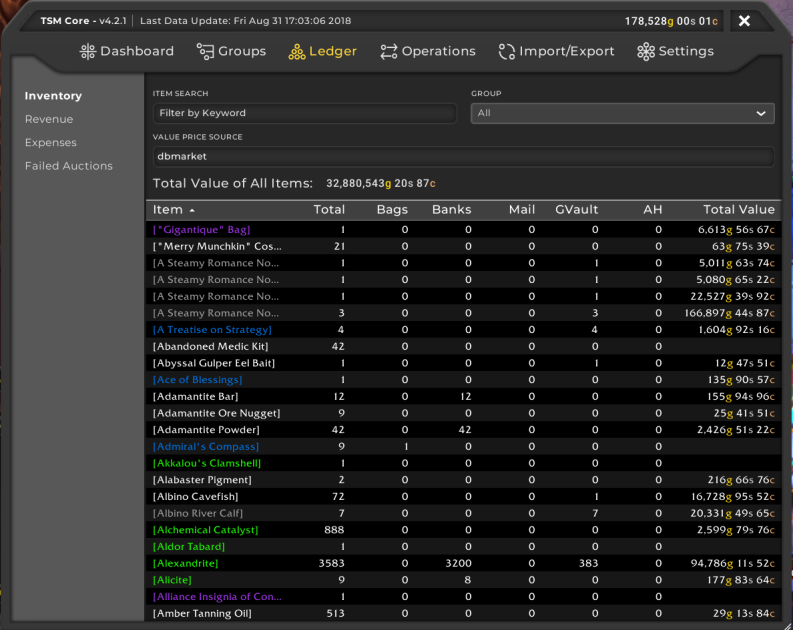 The Inventory Viewer has made a return to the addon which gives you a perfect overview of all your stock. In this interface you can see the items on the Auction House, in your bags, banks, guild banks and also in the mail across every character. More interface upgrades have arrived with the introduction of UI scaling. As well as resizing the dimensions of a particular TSM window with the resizer in the lower right corner, you can hold the ‘shift’ key before resizing to alter the scale of the window too. Right-clicking the resizer will reset the dimensions and the scale of the particular window to default. Now you can make things a bit more readable or save some screen real estate while working through your gold-making strategies. For those with multiple accounts, it’s now even easier to move your TSM setup to different accounts. After setting up an account sync within TSM, we have introduced an option to send your entire profile from one account to another. Naturally if your setup is quite extensive this may take a little longer than a few hyper-focused groups and operations. Through more than 23 releases there have been dozens of bug fixes, issues resolved and behaviours tweaked. Major adjustments include accommodations for Blizzard’s horribly slow Auction Houses, optimisations for account syncing, updates to Vendoring, Mailing, Crafting, and Auctioning plus tons of workarounds for addon conflicts after the launch of Battle for Azeroth such as ElvUI, AllTheThings, and Bagnon. Our blog has been up a little while now, and as planned it’s here to stay. We felt it would be the right thing to do to tell you a little more about why we stopped with the newsletter. And why we chose to present you our news through a blog instead. We’d hereby like to welcome you to our brand-new blog! We hope you’re pleasantly surprised by this sudden new part of our website! At the start of 2016, we started with the TSM Newsletter. There were a lot of things we wanted to talk about. We felt that by setting something new, we would create better community engagement. We would be able to tell you exactly what we wanted. Since then we’ve sent a newsletter every month. It’s been a blast to see so many of you sign up. Watching your opens and clicks gave us a lot of insight into what’s interesting. Recently we’ve been looking how we can improve all this. We want to bring you news quicker, and on a wider variety of topics. At the same time we don’t want to bury you under content that doesn’t interest you. That’s why we’ve set up this blog. We’ll let you know about developments as they happen. We’ll give you a wider variety of topics, while also making TSM news easier to find. The blog is very new, and we’re going to be trying our best to get everything right. But please bear in mind that we might need to change a thing or two in the future. We’d like the blog to be an interesting place. Both for us, and for you.